Update 3/1/13: I made this for an FRG meeting and it was GONE! Everyone loved it and I was really surprised that my husband, who knowingly ate it with cottage cheese in it, liked it. Both of us aren't really fans of lasagna anyways, so I'm excited to know that every blue moon when I am craving lasagna, he will eat this recipe of it. 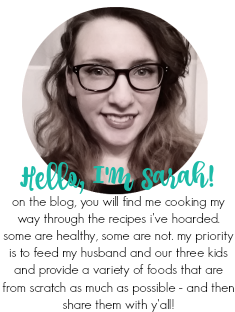 I also made one for myself, but I have yet to be able to make them. This is from bakerella. This breakfast egg bake is chock full of leafy green spinach plus ham and cheddar! Way back when I made this, my oldest two kids looked at me like I was insane trying to give them something so green for dinner (breakfast for dinner). I think as I write this in late 2017 that when I do make this again to update the picture (it desperately needs it! ), Matthew and Cami won't bat an eye. They eat spinach willingly and love frittatas. I think even Nick would gobble this up now too! When I got this recipe, I knew I was going to have to wait until my husband deployed to try it out. He hates mayonnaise and if he knows it is in a food, he will straight up refuse to eat it. I, on the other hand, love mayonnaise. This recipe was amazing. The chicken was definitely melting in my mouth. It was so tender and juicy and I loved it. Who needs banana bread when you can have banana cake?! This is the first recipe I was able to use my new Kitchenaid mixer for and I could not have been more thrilled! 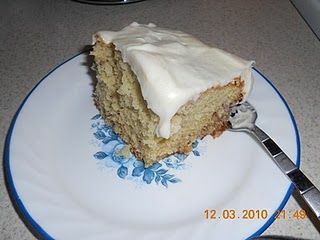 It was a great recipe that wasn't too difficult and turned out moist and topped with thick cream cheese frosting. The combination of the cake and frosting is wonderful together. Cheesy broccoli is the perfect way to mix up classic tatortot hotdish! 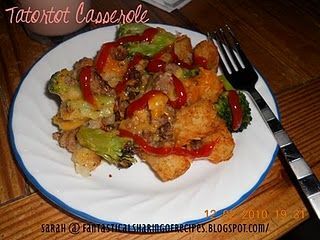 This is a variation of tatortot hotdish (a classic dish from my childhood) that I found on Cafemom from Harleymama2008. I immediately thought of how AMAZING it sounded. Instead of cream of chicken, use cheddar cheese soup, and instead of green beans or corn, use broccoli! HEAVEN - especially for my family because all of us love broccoli! It was absolutely delicious. 5 ingredients can make this lovely seasonal latte at home! My first Starbucks PSL was this homemade one. We didn't really have a Starbucks nearby at the time that I posted this recipe. New York had tons of Dunkin' Donuts and we even had a Seattle's Best Coffee in the Borders bookstore before it closed down. I really loved making this into a frappuccino too, which is honestly my favorite way to enjoy a PSL. Who knew a zucchini could add so much to barbecue pulled chicken! This is probably my favorite pulled meat sandwich recipe - I love the addition of zucchini! 5 ingredients and one skillet will get you this delicious quick weeknight meal perfect for the whole family!